It’s been three weeks since we were last out on a hill and so we were keen to grab the first fine day that came along to get out again. Tuesday seemed the best chance and so it was simply a case of deciding where to go. We’ve reached a stage with the Munro’s that the ones we haven’t walked that lie within a day trip of Irvine, are either too challenging for me, or involve a long walk in. 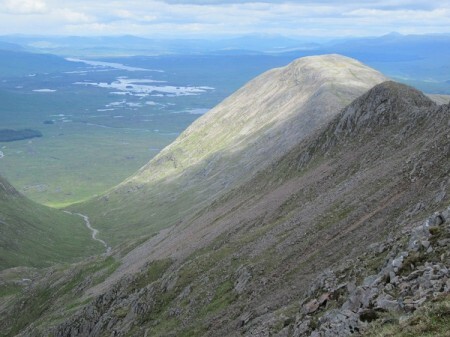 There are however a few that don’t fall into either category ….Stob Ghabhar in the Blackmount being one. 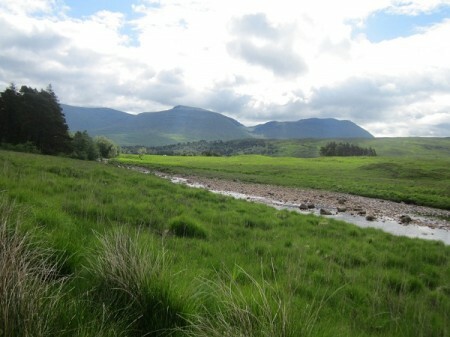 It’s a fairly big hill, rising to 1090m and has a formidable east facing corrie. One route to its summit takes a ridge leading across from Stob a’ Choire Odhair, but this is narrow and in one place very narrow and exposed …..not a place for me these days. 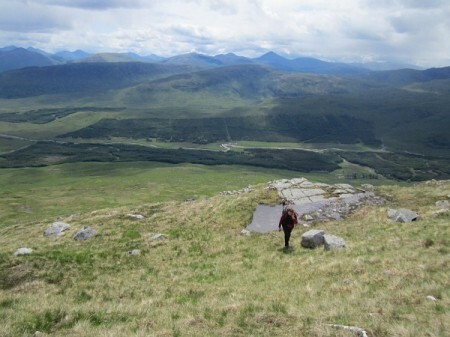 Our other option was to both climb and descend the hill by its gentler SE ridge….and this is what we decided to do. This route though still had one potential problem …it involves crossing quite a large stream in order to gain access to the base of the SE ridge. It certainly needs to be done when the river isn’t in spate and preferably when it’s low. Thankfully, here in the west of Scotland, we’ve missed all of the heavy rainfall that has been causing so many problems recently in west Wales and the south of England and so we were hopeful of finding the stream crossable. Our trip didn’t start quite according to plan though. The forecast had predicted 80% chance of a cloud free hill …but as we drove out of Irvine it started to rain and it kept on raining all the way to Crianlarich! What was more, the cloud was dark and heavy and well down on all the hills around Loch Lomond……it wasn’t looking promising! With the day light lasting well into the evening at this time of year, there wasn’t a rush to start walking and so we decided to stop at the Green Welly for a second breakfast ….in the hope that an extra 45 minutes might see an improvement in conditions. We didn’t really believe it but what the heck, an excuse for one of the Green Welly’s superb bacon rolls and a big mug of coffee, well, we couldn’t miss that could we?! As it turned out, it was an inspired move. The bacon roll did me a power o good and by the time we emerged again it had stopped raining and the first small breaks in the cloud were starting to appear. By the time we reached the start point near Victoria bridge, the cloud had all but lifted and there were bright blue patches appearing everywhere …it was looking good. I’ve wanted to climb this hill for a good few years and it proved well worth the wait. The stream crossing was a little problematic ….the water wasn’t high but even so, getting across it proved interesting for me! It took us about half an hour to find a place where I could cross without too big a risk of getting a soaking before we had even started going up hill. Once across though, the going was pretty straight forward up fairly steep grass and then higher up, rockier ground. The views were stunning all the way up but became superb once we reached the crest of the ridge and could see into the huge corrie that is the main feature of this hill. Wow …wonderful …it made you feel very small indeed. 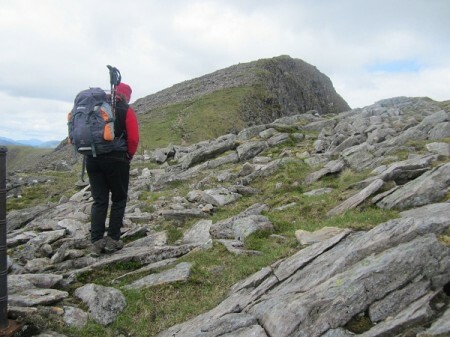 As is so often the case when walking any other than the famous summits in Scotland, …we didn’t see any other walkers and so we had the summit to ourselves. We had as I said, planned simply to return by the same route, but now with time in hand and the mountain spread out before us, we checked the map and decided to make a bit of a tour of it, first heading west along a broad grass and moss covered ridge and then down to a beallach where the map showed a stalkers path leading back to the forest and the track back to Victoria bridge. It was a great decision and made for a really enjoyable circuit of this hill ….always much better than simply going up and down by the same route. 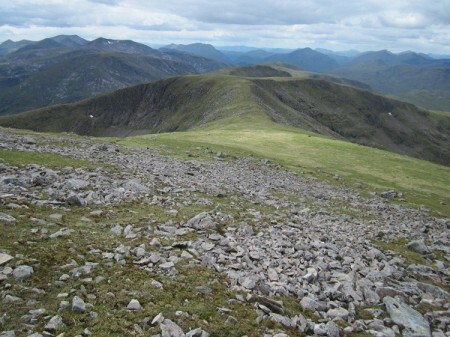 This was only the second ‘new’ Munro we’ve walked since I think February 2008 and takes my tally to 104. The trouble is that I caught myself thinking …’only one more and it’ll be 105 …and with a bit of effort I could reach 110 by the start of the winter’ ….ahhhhhh ..I might have caught the Munro ‘baggin’ bug again!! !